I’d always told people I’m from St. Louis. Who knew of Ferguson? As the one year anniversary of Michael Brown’s death approaches, “Ferguson” is once again emerging as a symbol of a year’s worth of unjustified deaths and the rethinking of police policy and practice. Ferguson, Missouri is my hometown. My mother’s extended family moved to Ferguson from rural Illinois in the late 1920s. My parents met and married there. Growing up in Ferguson in the 1940s and 1950s, I was surrounded by aunts, uncles, cousins and a cozy community. My first experience with the Ferguson police was that my aunt, the city clerk, would send a police car if I got sick at school while my mother was at work. My first job was counting parking meter pennies at City Hall. I no longer have relatives in Ferguson. But I’ve returned many times over the years for reunions, funerals, and just to revisit the city and see how my street and town are doing. 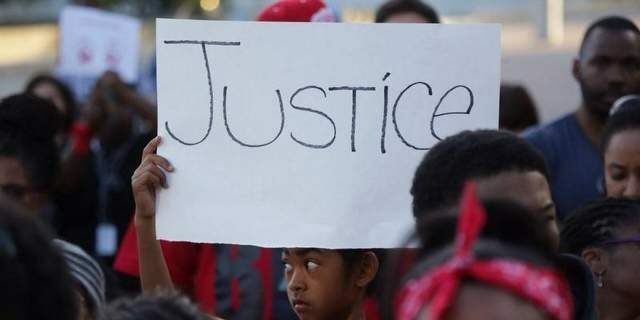 The media have given Ferguson extensive coverage in the wake of the Michael Brown killing. They have looked at recent changes in racial composition, but for the most part have not explored Ferguson’s earlier history. In my day Ferguson was a ”sundown town”–by city ordinance no blacks after 9 p.m.
“Ferguson” is now a symbol of racial injustice–and was for a time a battle zone. My hope is that the energy and outrage labeled “Ferguson” will be brought to bear, non-violently, on the goal of racial justice many of us hoped for as adolescents. Ferguson is older than what one might imagine hearing the word “suburb.” My elementary school, still in use, is over 130 years old. Prior to the Civil War Ferguson was a group of large landholdings; we might call them “plantations.” Most were eventually sold and a town platted. In my childhood there was still some recollection of old plantation boundaries, and a few “Gone with the Wind” mansions remained. My high school was on the grounds of the Thomas January plantation, on the footprint of the old manor house. There were some remnants of slave cabins. After Emancipation former slaves from Ferguson remained in the area. An all-black town, Kinloch, was eventually consolidated adjacent to Ferguson, drawing African Americans from other parts of the area. Although the two towns were back-to-back, only a few streets connected them, and entry into Ferguson was sometimes blocked by chains. There was little contact between residents of the two towns other than the employment of Kinloch residents for household work in Ferguson. We sometimes got a look at Kinloch. When my mother drove our cleaning lady home, I rode along and saw the unpaved streets, the open sewers, the shacks. One of my childhood memories is of a police car blocking entry into Ferguson so black kids could not attend our summer carnival. The dramatic contrast between conditions in Kinloch and our all-white Ferguson was powerful enough to create strong anti-segregation values in my generation, though we had to await Brown v. Board of Education and especially the Civil Rights Movement before things changed. We had little contact with blacks who were not domestics. Many of us attended Brotherhood Week, the one venue that offered minimal contact with blacks our own age. The Brown decision came just as we were graduating from high school. Ferguson-Florissant schools integrated the following fall (by court order, but peaceably), merging with Kinloch and the white working class suburb of Berkeley. The first post-Brown high school senior class president was an African American student. But it was 1968 before an African American was able to buy a house in Ferguson, through a straw purchase. Ferguson was 99 percent white in 1970. Fast forward to the 1990s. Kinloch was demolished so that the St. Louis airport runway could be extended. That never happened, but as a consequence most residents of Kinloch lost their homes. Many moved over to the newly annexed area off West Florissant, which became low-income, mostly African-American housing; the setting of Michael Brown’s death. “Old Ferguson,” the area where I grew up, remains virtually unchanged as a physical environment, complete with walking tours of historic homes with big lawns. The white population is concentrated here, with some mix of middle class blacks. One can still think in terms of White Ferguson and Black Ferguson. We lived with racial tensions as children and adolescents in Ferguson, but also with fond attachment to our town. Many of my classmates return for reunions after all these years. But I found returning for my 60th reunion last September a weird experience. Ferguson is no longer my home, but a concept. Imagine what it is like to see Anderson Cooper on the streets of your home town, along with other national figures. President Obama comments at key moments. Mr. Brown’s parents speak to a UN committee in Geneva. The “hands up” gesture appears in Hong Kong protests. “Ferguson” is now a symbol of racial injustice–and was for a time a battle zone. My hope is that the energy and outrage labeled “Ferguson” will be brought to bear, non-violently, on the goal of racial justice many of us hoped for as adolescents. Ferguson’s racial issues have been there for a long time. When I return to Ferguson for my next reunion, what will I see? A new version of the civil rights movement or a reprise of 1960s urban violence? Mary Ann Lamanna is Professor Emerita of Sociology at the University of Nebraska at Omaha, with a Ph.D. from Notre Dame and an M.A. from University of North Carolina, where she was active in the Chapel Hill civil rights movement in the 1960s. She is author of Marriages, Families, and Relationships, 12th ed. and Emile Durkheim on the Family. Ray, Thanks for your comment. I agree that structural controls over police departments and their practices are the goal. If the city council were representative and effective, that could serve the purpose. But clearly that format hasn’t worked in Ferguson.—As for the place of cultural factors, I wrote this originally as a personal expression, my personal experience of Ferguson, not so much a theoretical perspective on the issue. Still, I think Ferguson’s unique history, even in the larger St. Louis context, is relevant.